As I write this, the Bishops of The United Methodist Church are gathered in Chicago, debating and discerning what proposal they will offer to United Methodism in February 2019. But it has come to my attention that one element is claimed to be considered by the bishops at the moment, and it is one that I think must be drawn out and discussed. The Rev. Dr. Christopher Ritter from Illinois has penned numerous proposals to reshape United Methodism away from its current state. 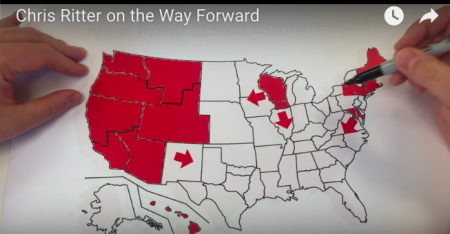 Ritter’s newest post is a video outlining a new plan to turn progressive regions into autonomous conferences affiliated with The United Methodist Church. Usually, these contributions are merely thought experiments (his original proposals didn’t achieve public debate at the GC2016)…except for a telltale line in the last minute of the video. 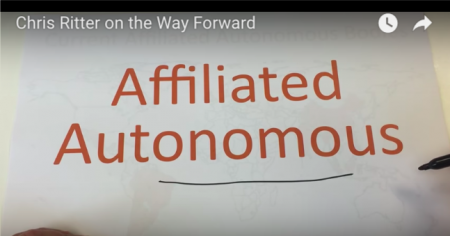 Ritter claims in his video that “There’s a group of Bishops working on this” type of autonomous affiliate conference model. That’s an interesting claim that I’m not going to treat as a throwaway line! If true, it either means some bishops are advocating for this in the Council this week, or bishops aligned with the Wesleyan Covenant Association (i.e. Bps. Lowry, Jones, Webb, Swanson, perhaps Farr) are writing it into their expected counter-legislation to the A Way Forward report. And also if true, it is right in line with the history of Ritter’s proposals to ensure that progressives get relegated to a lesser tier of influence in whatever is next for United Methodism. Amidst the various proposals that Ritter has offered, there’s an odd persistent feature: progressives receive significant diminishment in authority and become second class, unable to participate fully in United Methodism as conservatives would. In his first plan that remade our jurisdictions, Progressives would have their own jurisdiction, separate from the rest. Yes, 50 years after we eliminated the Central Jurisdiction which segregated African-American clergy and churches from white churches, Ritter proposed the same structure but for The Gays and their Friends. After the outcry, Ritter still submitted the segregation-inspired legislation but also offered the Organic Jurisdictions solution. This would be similar to the non-geographic proposal but allows everyone to choose a jurisdiction equally. It is an anomaly amidst the plans (unless I’ve read it wrong) in that it actually does treat progressives as full people, and not 3/5ths. Between those two proposals was a half-hearted (but still telling) proposal of a “Flat UMC” that, as we reported, would have eliminated the Western Jurisdiction. Gerrymandering away progressive regions and de-consecrating Western bishops would be the immediate desired effect. There are more posts, of course, but this is all a lead-up to the problems in the recent proposal: yet again, Progressives are given second-class status in the United Methodism to come. Ritter proposes to assign progressive jurisdictions and conferences to be affiliated autonomous conferences, which currently exist in South America, Mexico, Great Britain, etc. These conferences send representation to General Conference and the Council of Bishops but operate their own Book of Discipline and ordination standards. It works for some international communities to do the shared mission with local adaptation in a more defined way than our current flexibility with the Central Conferences. This sounds nice, except the AA conferences’ representation is limited (not representative based on membership) and they do not have assigned presence on General Agencies, nor are their bishops assigned to any executive leadership in The UMC. By assigning progressive regions to these type of conferences, all progressives would lose any voting power and voice, and all conservatives would retain full privileges, ownership, and power. Here’s the turn: Attempts to sort out United Methodism by national bodies and individuals is mostly by choice – there would be an opportunity to select which branch we want to be in, or which jurisdiction, etc. But this attempt, if you listen carefully to Ritter, is by force, not choice. If GCFA (or someone) decides a conference isn’t “upholding the discipline” in a specific way, GCFA places them under restrictions until they take the affiliated status. “Under restrictions” means restricted from receiving money and from using the Cross and Flame logo, all in an automatically-applied category whose appeal is subject to the whims of a disconnected board or committee (or even individual). The critical turn for each of Ritter’s proposals is to take what is a choice and make it into an automatic expulsion. This move from peer accountability (a hallmark of Wesleyan accountability) to automatic suspension is also reflected in conservative activists attempts to create minimum penalties for LGBTQ-related offenses. 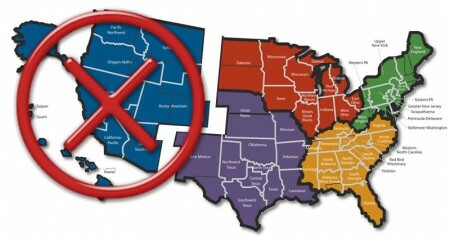 If implemented, the “One Church” model might become “Two Church” but with the progressives having a nominal–not representative–presence on General Agencies, Council of Bishops, and all decision-making bodies of United Methodism. It’s less like the multi-branch and more like a caste system, a dream of conservatives to legislate away progressive influence forever. In summary, one always has to ask “who has the power?” at the end of a reorganization, and it is disturbing that at the end of each of Ritter’s proposals, the Progressives are either disbanded, diminished, or outright denied a seat at the table in the Next United Methodism. Progressives are a minority perspective in United Methodism anyway, but apparently still need to have their status diminished to “fix” United Methodism. I appreciate Ritter’s persistence and our shared (but antithetical) interest in reshaping United Methodism. I name the above today to draw out a persistent bias in his proposals, and one that I hope will not be reflected in either the A Way Forward legislation or the Wesleyan Covenant Association counter-proposal, which Ritter (who sits on the WCA Board) will undoubtedly have a hand in penning. May mutual affection reign and we move forward together in shared ministry. Thanks for reading, commenting, and sharing on social media…and with your Bishop this day! The article “The Odd Persistence of Ritter’s Two-Class Methodism” was originally posted on HackingChristianity.net. 1. Presbyterians split over the last few years over the same issue. There are now essentially two separate Presbyterian denominations. But, without a fair, negotiated, amicable plan, there are also many law suits and hard feelings. 2. Lutherans have been in several denominations forever. The largest, Evangelical, is more progressive and welcomes homosexual management and marriage, the Missouri Synod is traditional, conservative. Both exist just fine separately. Let this old non-credentialed-pewster humbly offer the fair and common sense plan: In the words of Fleetwood Mac, “Go Your Own Way”. Progressives want control of their doctrine and their destiny. Let them go and take the churches that want to go, go. And, let we who want our traditional Methodist Church, take our churches in our direction. Honestly, progressives are never going to accept anything less than full inclusion. And, many traditionalists, if I am any example, will never attend or support a church with gay clergy or bishops or gay marriage ceremonies – not to mention general differences on 2nd amendment and other issues. These two sides are fully incompatible with non-negotiable positions. Reorganize conferences and churches by their choice via electronics, not by geography. As with Presbyterians and Lutherans, build completely separate Methodist organizations and management, using the core “Methodist” name with new identifiers. Have NO overlap of management or finances. ACCEPT THE INEVITABLE, for goodness sake, negotiate a fair plan and let’s move on. Please!